Maine Mobile Health Program is our state’s only farmworker health organization. Our collaborative model involves folks who carry the commitment to make a difference in the lives of Maine’s farmworkers. By linking agricultural workers to care and services, we aim to reduce health disparities and inequities of access for this workforce. Putting fruits and vegetables on ALL of our tables is not only vital work; it positively impacts our collective health. Annually we provide care to over 1,500 patients. We offer mobile medical and nursing care to patients at farmworker camps. MMHP maintains over 50 voucher contract sites to complement the mobile care, and offers transportation, interpretation, and care coordination services to link a patient from the mobile unit to a community provider. To maximize access, our mobile units and outreach workers travel throughout the blueberry, apple, egg, Christmas tree/wreath, tree-planting, and broccoli harvests. MMHP is committed to comprehensive care and offers health education and outreach services to farmworkers on key health issues like pesticide safety, hypertension and depression. Promotoras, clinicians and outreach workers speak Spanish and Creole to meet the linguistic needs of Maine’s farmworkers. 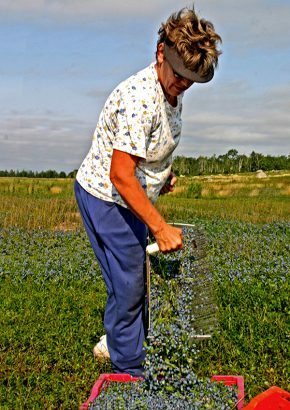 MMHP coordinates a farmworkers’ resource center in the DownEast region during the blueberry harvest, providing central access to our mobile unit team. The resource center also provides farmworkers with access to educational services, social services, a food pantry, and legal aid. The Maine Mobile Health Program collaborates year-round with farmworkers, growers, local organizations, and primary care providers to offer Maine’s migrant seasonal farmworkers (MSFWs) the best possible access to care. 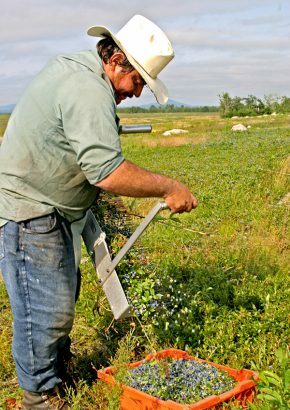 MMHP seeks to increase its partnerships with Maine’s community of growers to ensure that our services reach all MSFWs in Maine. MSFWs are one of our country’s most invisible populations. The health status of MSFWs is compromised due to the physically demanding nature of their work, the potential for substandard housing, little to no access to care, and geographic isolation. Most MSFWs live below the poverty line, lack health insurance, experience interruptions in their medical care, and may not have access to entitlements/programs because of immigration status. MSFWs also face a lack of culturally and linguistically appropriate services and may be unfamiliar with the local health system or other resources. While MSFWs make an overwhelming contribution to our lives and health through the work of harvesting our fruits and vegetables (80% of which is done by hand in this country), they remain a critically vulnerable community. Unfortunately, we have come to take for granted the low-cost, high-quality produce available in our local grocery stores and do not consider the individuals or families that plant, nurture, and harvest our produce.